Chief Justice H L Dattu today said he will be retiring tomorrow as a "fully and thoroughly satisfied"man who could do "many good things" for the Supreme Court and towards the cause of bring down pendency. Wishing all success to his successor Justice T S Thakur, Dattu, during an informal “thanks giving” interaction with media persons at his 5, Krishna Menon Marg official residence on the eve of his retirement said “From whatever foundation I have laid I’m sure justice Thakur will make things much better. He is a brilliant judge”. 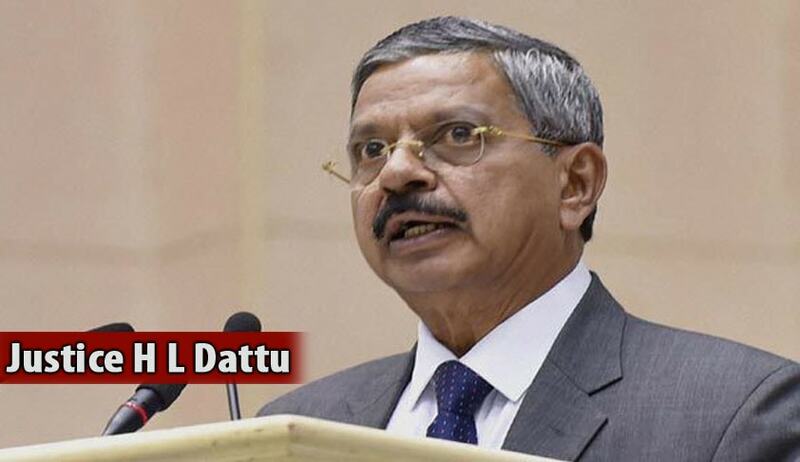 Dattu said he “is fine” with the post of National Human Rights Commission chairperson as a post retirement job and remained unperturbed by the heated debate on propriety of former judges accepting post-retirement job before a minimum cooling off period. “If I get it, it is fine and if I don’t get it also it is fine. Till now I do not know whom they have decided to take”, 65-year-old Dattu said. The post of NHRC chairperson has been lying vacant since May this year after Justice K G Balakrishnan completed his nearly five-year-long tenure. When asked about the increasing demand for cooling off period for retired judges to accept post-retirement job, Dattu said “I don’t have any comment to make”. The proposed move has already drawn criticism. Former Additional Solicitor General Indira Jaising had stated that the news was “particularly disturbing” as it comes at a time when Justice Dattu was still the Chief Justice and it will “affect the independence of judiciary”. “The recently delivered NJAC judgment places great emphasis on independent of the judiciary as a basic feature of the Constitution. Independence can be undermined in different ways and one of them is offering post retirement benefits immediately upon retirement,” she had said. On allegation that he granted bail to Tamil Nadu J Jayalalithaa in a DA case without following due process of law like issuing notice to the prosecution, the CJI said“Judges should not be bothered about what others say. I am guided by my work conscience, god and guru”. Dattu said public interest litigations should be for a cause and it will create a nuisance if filings are not regulated. Dattu said that the delay in disposal of cases and their pendency to the tune of 3.2 crores was the single most challenge that confronts country’s legal system and innovative ways have to be found out to address the situation. “If right to access justice is to remain meaningful then it should be the disposal of cases within a reasonable time,” he said, noting that “delay (in disposal of cases) and pendency was the single most important challenge that India’s legal system is facing”.